We cater for divers of all ages – including the youngsters! From the age of 8 years and upwards, DM Scuba are able to offer diving experiences to suit budding mermen and mermaids. Let your child test the water with a Discover Scuba Session or a Bubblemaker session! This will introduce them to the basic equipment and skills involved in scuba diving and gives them their very first scuba diving experience in a swimming pool. The Discover Scuba Session (12yrs+) involves some basic theory on what to do and what not to do and gives them approximately 60 minutes of in water enjoyment. The cost of this much fun? Only £30. (Discounts for groups of 4 or more) no more than two children per instructor. All they'll need is a swimming costume a towel and some enthusiasm - we supply the rest. If you have your own pool then we can supply equipment and staff for a pool party with an added dimension - you can really give your friends a memorable experience! All of our Instructors who work with children are Enhanced DBS Checked for your piece of mind, plus; we actively encourage Mums and Dads to get suited up and join in with the kids as well! We can also offer the full PADI Open Water diving courses to children from the age of 12, subject to the instructor’s discretion. These can be combined with adult courses if required, allowing the whole family to learn to dive together! 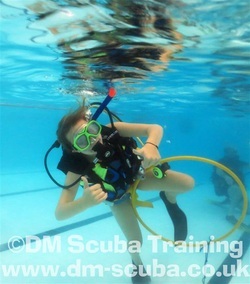 DM Scuba Training is a PADI Approved Youth Training Centre! If your child is between 8 - 12 years old and able to swim, we can give them the chance to complete a Bubblemaker session in our swimming pool. This course, designed especially for small children, will allow them to safely experience the thrill of scuba diving for the first time. Under direct guidance from our experienced instructors, they’ll learn to use proper scuba equipment and breathe underwater. These sessions are designed to instil confidence in your child and get them used to breathing underwater while having fun! We combine the Scuba with snorkelling, and other activities which are led by the children. These are great sessions to complete before committing to a full Seal Team Course. Have you ever wondered what it's like to dive with flashlights, take digital pictures underwater or float effortlessly like an astronaut? These are Aqua Missions that introduce you to wreck, navigation, buoyancy, underwater photography, environmental awareness and more. The children also get to whizz around on underwater diver Propulsion Vehicles (DPVs)* and play with Bubble ring guns*. Here's their chance to do some cool stuff in the pool, meet friends and share in the adventure of the underwater world. 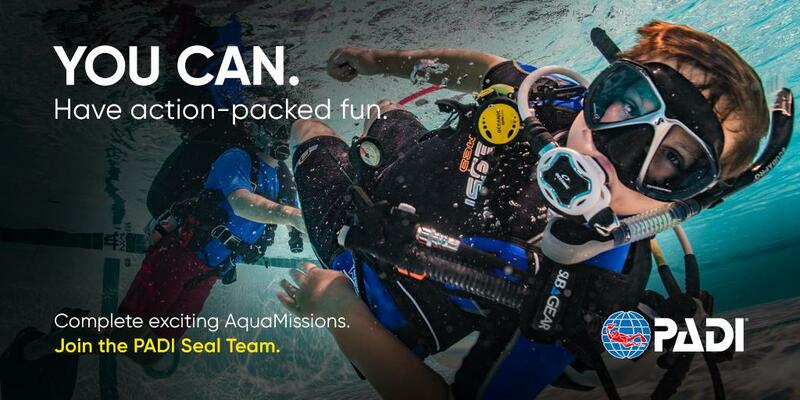 The best part of the Specialty Aqua Missions is that they reinforce safe diving skills while the kids are having fun. PADI Seals get to sample a wide variety of dives. In addition, it provides parents with a structured programme that lets their children develop skills, learn about the aquatic environment and have a lot of good, clean fun. This is also an excellent way to introduce kids to scuba diving prior to full Open Water Diver certification. For large groups, pool parties or private hire see our link for Pool Parties / Clubs and Schools. Held during our Bristol pool sessions every Thursday evening. The Seal Team is run through the summer holidays. Summer 2019 Seal Team Course! We offer group discounts on multiple bookings for family and friends if the course is run at the same time. 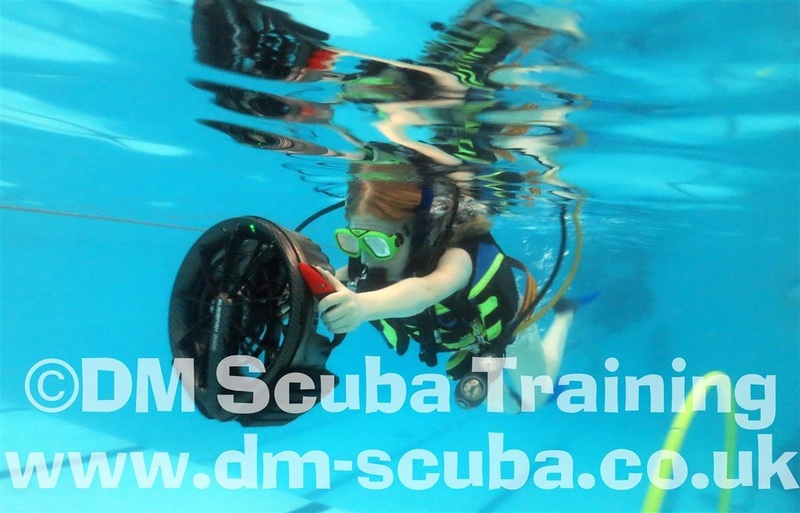 *Diver Propulsion Vehicles and Bubble Ring guns are used on most of our general Thursday evening pool Bubblemaker sessions, but there may be times where this is not possible due to safety concerns. If these two items are important to your child please let us know before booking and we can book your child on to one of our quieter sessions.